Daniels, Don 2017. A method for mitigating the problem of borrowing in syntactic reconstruction. Studies in Language, Vol. 41, Issue. 3, p. 577. Viti, Carlotta 2017. Semantic and cognitive factors of argument marking in ancient Indo-European languages. Diachronica, Vol. 34, Issue. 3, p. 368. Johnson, Cynthia A. 2016. Syntactic reconstruction and Proto-Germanic. By George Walkden. Diachronica, Vol. 33, Issue. 1, p. 138. List, Johann-Mattis 2016. Beyond cognacy: historical relations between words and their implication for phylogenetic reconstruction. Journal of Language Evolution, Vol. 1, Issue. 2, p. 119. Seržant, Ilja A. 2015. 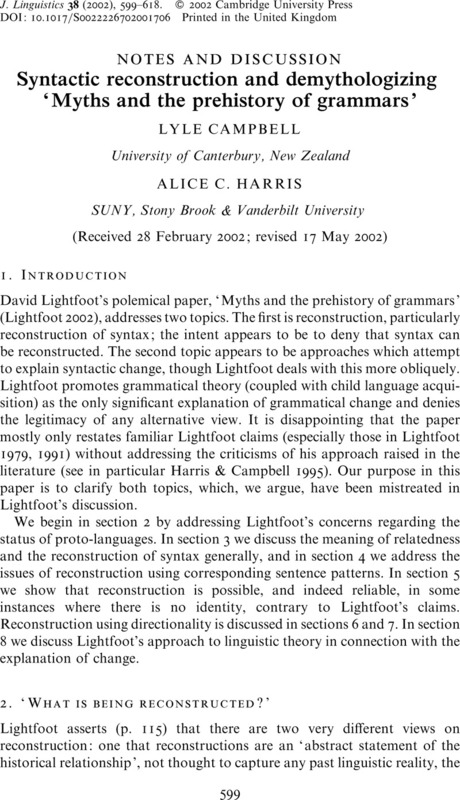 Perspectives on Historical Syntax. Vol. 169, Issue. , p. 117. Viti, Carlotta 2015. Perspectives on Historical Syntax. Vol. 169, Issue. , p. 1. Hock, Hans Henrich 2015. Proto-Indo-European Syntax and its Development. Vol. 75, Issue. , p. 51. Smitherman, Thomas 2015. Perspectives on Historical Syntax. Vol. 169, Issue. , p. 93. Henrich Hock, H. 2010. Principles of Syntactic Reconstruction. Ed. by Gisella Ferraresi and Maria Goldbach.. Kratylos, Vol. 55, Issue. 1, p. 1. Thomason, S. 2006. Encyclopedia of Language & Linguistics. p. 397.